As of this writing, Israeli Air Force attacks today on the occupied Gaza Strip killed nearly 400 or more people and injured over 1900 people. These Israeli attacks come on top of a brutal siege of the Gaza Strip, which has created a humanitarian catastrophe of dire proportions for Gaza's 1.5 million Palestinian residents by restricting the provision of food, fuel, medicine, electricity, and other necessities of life. While the scope of civilian casualties in today’s attacks is not yet clear, it is unmistakable that Israel carried out these attacks with F16 fighter jets and missiles provided by the taxpayers of the United States. From 2001-2006, the United States transferred to Israel more than $200 million worth of spare parts to fly its fleet of F16’s. In July 2008, the United States gave Israel 186 million gallons of JP-8 aviation jet fuel. Last year, the United States signed a $1.3 billion contract with Raytheon to transfer to Israel thousands of TOW, Hellfire, and “bunker buster” missiles. In short, Israel’s lethal attack on the Gaza Strip could not have happened without the active military and political support of the United States. Therefore, people in the United States need to take action to protest this attack and demand an immediate cease-fire. 1. Take to the streets and make your opposition public. Thousands of people have already taken to the streets in dozens of cities across the U.S. and worldwide to protest Israel’s attacks on the Gaza Strip. See the calendar of protests and join one near you or organize one and send us the details. 2. Educate and organize people in your community. Attend public events and pass out information on Israel’s atrocities in Gaza and to collect signatures to end U.S. military aid to Israel. 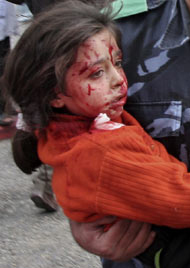 Download a flyer on the Gaza Siege and a petition to collect signatures. 3. Contact your elected representatives and set up emergency meetings with your Members of Congress. Demand from the President, your Representative, and Senators an unconditional, immediate cease-fire; full humanitarian access to Gaza and a lifting of Israel’s siege; and accountability for Israel’s misuse of U.S. weapons to kill Palestinian civilians. Send your letter online today or download a sample letter. Find contact info for your Members of Congress by clicking here. For tips on how to arrange a meeting, click here. 4. Get the message out to the media. Call in to talk radio programs and write letters to the editors. To download talking points for the media, click here. To find contact information for your local media, click here. 5. Sign our open letter to President-Elect Obama calling for a new U.S. policy toward Israel/Palestine and find out other steps you can take to influence the incoming Administration by clicking here.